Surfing Atlantic Waves and Basking under the African Sun! 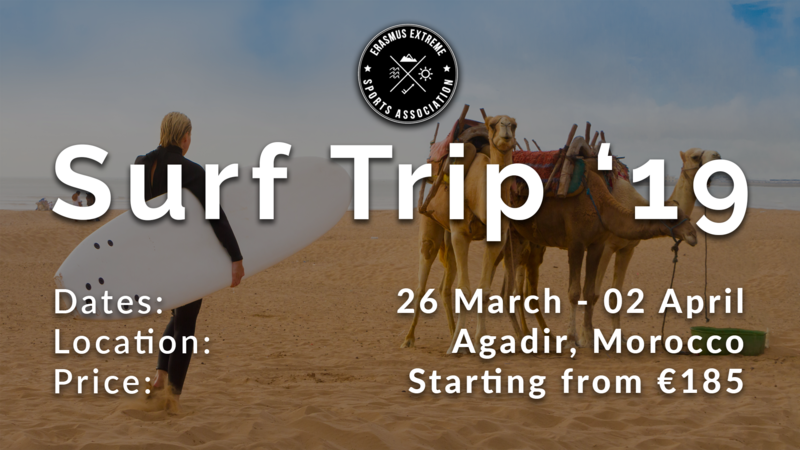 Join our International Surf Tribe on an expedition to Northern Africa! Get your tan on and some wavy vibes in under the Morrocan sun from March 26th to April 2nd. Here, we will enjoy a week of surfing, chilling on the beach, and exploring North African nature. We rented out an ENTIRE surf camp bordering some of the world’s best surf spots at a 10min walk. Wake up every morning to the Atlantic sea breeze and African sunshine. Enjoy the waves surrounded by our international surf tribe. On Tuesday the 2nd of April, we will return to the Netherlands with life-lasting memories and exotic stories. Tickets will become available on www.erasmusextreme.com/shop on February 1st 15:00. There are 50 tickets available and these will be distributed on a first-come, first-serve basis. Your flight ticket will have to be bought by yourself but we will try our best to coordinate the same flight times. Flight ticket: You are responsible for buying your own flight ticket! Visit the Extreme Store at www.erasmusextreme.com/shop where the ticket sale will start from February 1st at 15:00.